The Likud was the big winner of the 2003 elections (39 seats, a gain of 20). Many white logo on blue flags could be seen at the party headquarters celebrations. It seems the previously reported flag of a logo on national background is obsolete and not in use anymore. The Likud party flags show their logo [instead of the Magen David] on the national flag. 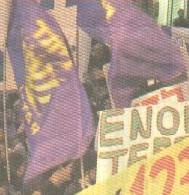 Ma'ariv newspaper of 8th June 2001 showed this picture of a demonstration in Jerusalem. The flag is the flag of Betar youth movement, which is strongly connected with the Kherut (Freedom) movement, the main part of Likud, one of the major parties in Israel. Betar are the initials of Brit Yosef Trumpeldor, Joseph Trumpeldor Union, after an Israeli hero. The youth movement also operates sport clubs one of which is the famous Betar Jerusalem F.C. The flag is a gold menorah on blue with Betar name in Hebrew and English.